From Old Trafford to Parc des Princes? With Ander Herrera available on a free transfer come this summer, it’s unsurprising many teams are queuing up for the experienced, battle-hardened Manchester United man’s signature. Although it’s been reported he may still sign a new deal, he’s yet to do so, which has only served to amplify interest in the Spaniard, who’s apparently being monitored heavily by Arsenal and Paris Saint-Germain. When recently asked about the interest from PSG, Herrera’s response made for fascinating reading. “It is logical when you have three months of contract and there are stop selections,” he explained to El Periodico. Whatever his future holds, either in Manchester or elsewhere, the 29-year-old’s talents will unquestionably be a fine asset. Indeed, the dedicated, quality laden and, at times, underrated midfielder has shown he’s still operating at a high level, something his recent upturn in form under Ole Gunnar Solskjaer‘s management has aptly demonstrated. A huge defensive weapon, he tucks into his work here with tremendous intensity, energy and physicality, as he gets at it with a nice blend of force and smarts. Extremely fit and durable, the former Athletic Club star’s proactivity and concentration ensure he’s a fantastic presser and counterpresser, for he reads the play superbly to duly react to certain triggers. These include when an opponent is about to receive an underhit pass, with their back to goal, in an open posture or near the touchline. In doing so, he effectively limits his targets’ chances of executing their actions cleanly to help force them into mistakes through their lack of time and space. 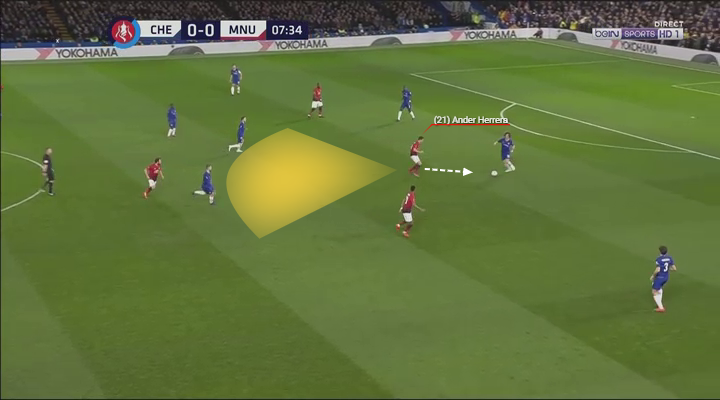 Another important factor towards his success comes from how he angles his pressing so he uses his cover shadow to block pass lanes behind him, which further compounds issues for his adversaries and minimises their options. Applying his challenges with vigour and tenacity, the languid Herrera’s never afraid to get stuck in, as his wholehearted approach sees him set a wonderful example for his teammates to follow. In addition, the way he issues instructions and is constantly gesturing and communicating with his teammates amplifies what a leader he is and how respected he is at the club. Meanwhile, in terms of his offensive output, the fearless operator passes the ball concisely, especially over short distances, with him playing a significant role in constructing the Red Devils’ offensive moves through the thirds. Even though he’s not a hugely risky passer, who usually prefers to keep things ticking over nicely, if the moment arises to get creative to pierce his foes’ structure or play in a mate with a through ball over the top, he’s more than capable of doing so. 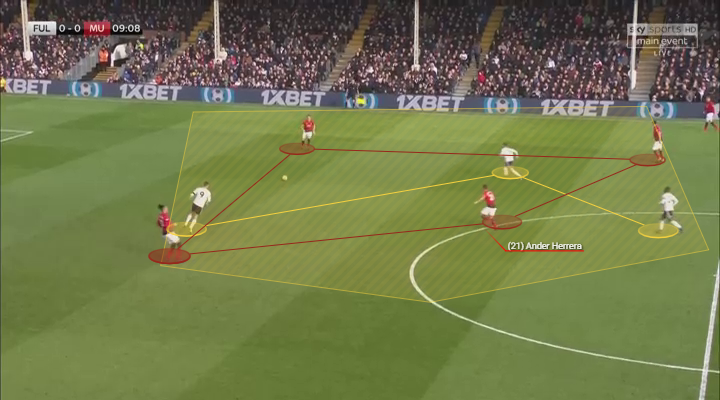 Herrera’s neat first touch and control combine to see him use his dribbling ability to good effect too. Relishing opportunities to drive forward and place his markers under pressure, he’s done this well to unbalance his opposition. Accompanying this with his intelligent movement, which sees him shrewdly identify openings to receive in the opposition’s structure, he’s always offering himself as an option for his teammates. Be it finding space between the opposition lines of midfield and attack or midfield and defence, plus by strategically moving into zones to create numerical superiorities, he’s proven how useful his positional nous is. 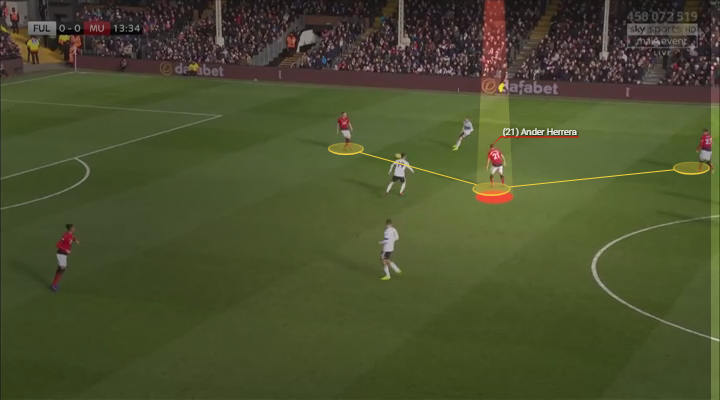 Picking his moments when to surge forward into the box, he’s so hard to track when doing this, for the defenders are usually occupied by United’s forwards, leaving him to neatly target the gaps present within the backline. Disciplined, proactive, hard running and full of smarts, his statistics depict his two-way contribution, as he’s completed 5.96 interceptions per game, 2.9 tackles pg, 5.8 ball recoveries pg, 0.7 shot assists pg and 89% of his 53.44 attempted passes pg. With the player himself unsure of what his future holds for next season, instead commenting that he’ll leave it up to his agent and that he’s solely focused on seeing out the season, it’ll be intriguing to observe where he’ll be plying his trade in 2019/2020. After five years at United, where he’s been a fantastic teammate, servant and player for the club, if he does choose to leave, he’ll deservedly depart as a highly respected figure by all associated with the club due to his tireless efforts on the field, kindness of the field and desire to make everyone around him better. Support Ander Herrera and the rest of Manchester United when placing your football picks at Eastbridge brokerage’s Skype Betting service or through VOdds broker platform!